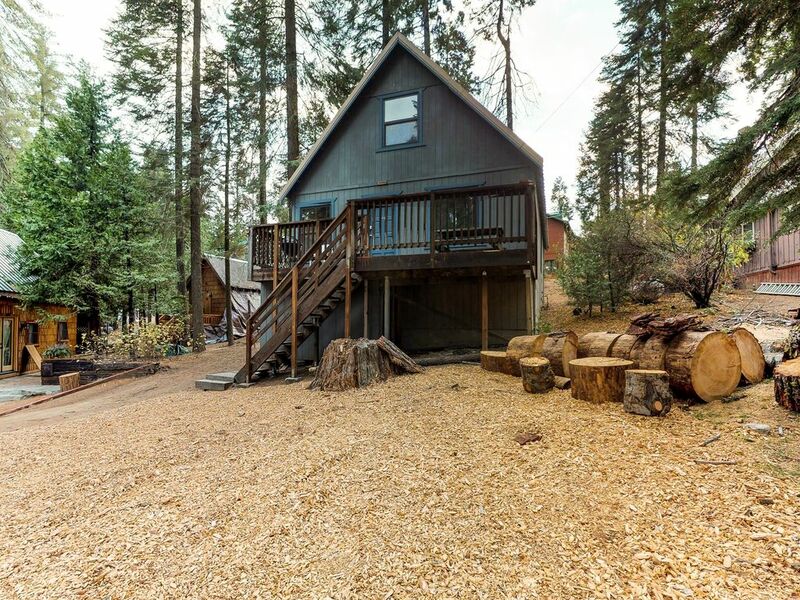 Enjoy a small slice of perfection at this snug chalet just minutes from the shores of Shaver Lake! With a huge deck for the summer months and a cozy wood stove for the winter, this charming vacation rental has everything you need for a delightful year-round retreat. Located in the secluded village of Shaver Lake, this lovely home lies within walking distance of the town's peaceful main street, where you'll find shops, restaurants, and cafes tucked in the evergreens. After getting settled, head to the water! One of Central California's most beautiful lakes, Shaver Lake offers incredible boating, swimming, and fishing, as does Huntington Lake to the north. You'll also be just 19 miles from China Peak, which offers superb mountain biking in the summer, and skiing and snowboarding in the winter! Tucked away in a quiet neighborhood, this lovely vacation rental is the perfect place to retire at the end of an exhilarating day outdoors. Fire up the charcoal grill and hold a summer out BBQ out on the deck, or snuggle up inside next to the wood stove during the colder months! You'll find a fully equipped kitchen for fixing all your favorite meals, and free WiFi is provided so you can easily stay connected with everyone back home. Treat yourself to a little peace and quiet among the natural beauty of the Sierra National Forest. Book your reservation today! Parking Notes: 3 vehicles can park in front of the home. There is also boat parking available. No parking on the street during winter months due to snow removal. No recreational vehicles or camping allowed in yards and driveways. Boat & Trailer Parking: Allowed only in West Village & East Village. We recommend to all guests to utilize Sierra Marina for a wet slip and/or trailer parking. The cabin is very basic. I stayed for 2 nights for a 4 bedrooms/2 bath. So, for the price, it was not bad. The good: It’s located near town! You can walk to all the shops. All the heaters work good. Plenty of towels and blankets provided. Lots of toilet paper. There is cable TV with movie channels! If there is snow, a service person will come by and shovel the deck. Neighbors are close but super nice! The bad: The kitchen is outdated and so are the pots/pans. No dishwasher. Washer is loud! Bring your own detergent. Dryer works but the lint holder falls out. The downstairs bathroom door does not close all the way and the water leaks out. We had a fuse blow out twice and had to call to locate the fuse box. The sofa pillows had a strong animal odor. There is random old photos of people all around the home, which I found to be unwelcoming. I won’t be renting this cabin again but it served its purpose. Thank you. We appreciate you sharing your concerns with us. We have maintenance scheduled to check the issues you have reported and will take action after determining what needs it immediately. Thank you! This was our first time up at Shaver Lake, and we’d planned to go snowboarding and also do a bit of exploring around the two lakes. This cabin was perfect for our needs, the size to accommodate our family, the amenities to help us relax after a busy day and the proximity to the lakes and China peak were more than we could have asked for.